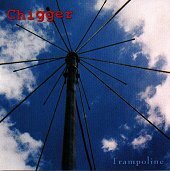 Sweet, tingling indie pop, Chigger's five-song debut is an explosive, yet contained, exploration of feelings through indie rock that can be poppy, mellow, or very bouncy and fun. "I Said I Said I Said" is relaxed, laid back, and catchy. The soft female vocals accompany the delicate music perfectly, as they bounce around and catch you on a hook. "Sliding West" is the same way, though this time the guitars get a bit fuzzier and try to turn things up a notch. Then there is the album closure, "Noni," a bouncy song that you'll find yourself clapping your hands along with or just sitting there smiling and singing along. The band is a bit rough and underdeveloped, though their pop hooks and catchy indie pop melodies are warm enough to mask that. This disc is a good taste of what the band is about, though it seems like a taste before the full-length (full course meal) comes along. I'll give it a B.